What are the most effective antiaging products? Is there even such a thing as a "perfect" anti aging cream? This is not a frivolous question. To me, it's about much more than just the products themselves, specific ingredients or other shallow values mind you. The most effective anti aging products are the ones that make me feel good in my own skin! That comes from more than just topical treatments. That comes from inside - where I feel that beautiful skin begins, and where I am going to start talking. Food Products. Anti-Aging or Pro-Aging? Here is something crazy that I have been focused on over the past six months. Everything that "they" are telling us to eat as our base food is starch. Do you know what happens to starches? Well, they turn into glucose the SECOND that they touch your tongue. Do you know what glucose is? It is sugar! Sugar raises your insulin production and causes many things, most notably Type II Diabetes. But, also aging skin and allergies and more. I will get into that. [A] The World Health Organization recommends that no more than 10% of an adult's calories – and ideally less than 5% – should come from added sugar (also honey, syrup, fruit juices). For a 2,000-calorie diet, 5% would be 25 grams. The WHO suggests to limit daily sugar to 6 tsps (25 g) for women, 9 tsps (38 g) for men. Yet the average American consumes almost 20 teaspoons every day. That is 66 pounds every year. ***Do you realize*** that your entire body of blood only contains 1 teaspoon of sugar in it? Any more that gets ingested will trigger insulin to remove it from the blood because it is not wanted. Therefore it is best to keep sugar out and therefore excess carbohydrates as well since they turn directly into sugar (glucose). Fact: Each slice of wheat bread = 6 teaspoons full of sugar. [B]. One hundred fifty grams of rice = 10 teaspoons of sugar. A single white potato = 7 teaspoons! I bet you never even knew you were a "sugar junkie". I knew that I was, but I know better now and have completely updated my diet. The grains themselves are also Extremely *with a capital "E" inflammatory. Grains (wheat especially) causes things like: allergies, pain and fatigue, acne, joint pain, hair loss, rough dry skin, rashes, poly-cystic ovarian syndrome, accelerated aging (wrinkles, spots and more) and many other socially disruptive, emotionally difficult and physically disfiguring conditions. When I was younger I really didn't have many troubles. I had good skin and a great figure, but those things are fleeting - like your high metabolism. Did you know that every single time you "cut calories" you are ruining your metabolism, and that can take years to fix? You cut calories (energy) then your body needs to react by cutting its burning of calories. Learn all about fixing your metabolism here with Dr. Jason Fung. I feel like things just keep building and building up in your body and then - all of a sudden - the toxins have to come out. And come out they will! I was plagued with acne on my face and back. I had allergies *mostly seasonal, hair thinning with a few small bald spots... and also Dyshidrotic eczema. Not one of them was fun. What did I do? Well, if you haven't heard about my acne journey and how I started Platinum Skin Care, then you need to read this article about that. Lucky for me, the treatments that I used to control my acne are also amazingly beneficial for aging issues such as wrinkles and spots. So, with my acne and aging skin improving, I was still dealing with very problematic eczema. I had tried literally - every topical and several prescriptions to aid in controlling this with ... nada results. Every few weeks or so I would have band-aids on my fingers to keep the skin together so it wouldn't split completely. Very painful. Now, it was just about 5 months ago that I decided to change my diet, and you are really going to want to hear about how it helped. The Best Anti Aging Diet *and it isn't the pyramid style. Just like many people I had added on some extra "baggage" over the past 5 years and wanted to get rid of it. Exercising and eating our "healthy" US diet wasn't helping me, so I started doing some research and came across a doctor named Jason Fung. He was a diabetes specialist and nephrologist, and he explained in great detail why people get fat and diabetic and unhealthy and what they could do to turn it around. He talked all about LCHF and Intermittent fasting. LCHF stands for Low Carb High Fat and is a very healthy diet for most people in the world because it follows our "hunter gatherer" ancestors. You have to do a more prolonged fast for some of those big changes, but I am not there yet. I have fasted for about 4 days and I do intermittent fasting every day. One day I would like to do a longer one just for all the health benefits. Hey if Ghandi and Jesus [insert all major religions] can do it, so can I. So, after listening to Dr. Fung, and Dr. Eenfeldt (Dr. E. has an amazing site with hundreds of hours of doctor's presentations on ketogenic and LCHF), and Dr. Unwin, and Dr. Westman, and Dr. D'Agostino, and Professor Noakes ... and so many more..... I changed my diet and no longer eat any starches (bread, pasta, rice, potatoes...) or sugar. Instead I eat just the healthy veggies and protein with sweeteners like monk fruit and stevia. The only fruit that I will eat on occasion are the berries (black, rasp, blue) as they have the lowest sugar content. I just pair them with something super high fat like some home made whip cream (heavy cream + vanilla and a few drops stevia) and I have an awesome snack. I feel absolutely AMAZING! And you know what else is looking utterly perfect? My fingers. My eczema! Without the grains and sugar my skin is calm. No acne ever, and nothing but smooth skin on my fingers for weeks and weeks now. *That is a big time improvement that I could literally, jump for joy over. What I have learned is to just flip that pyramid over. Now you have a healthy diet. So, one of the most effective anti aging "products" doesn't even have to be applied to your skin, just watch what you eat. Once you have your body working like it should, and giving you all the benefits that a healthy diet full of fats and veggies that your skin craves, you will definitely want to incorporate skin care products that actual dermatologists recommend. This is simple though, as there are only a couple of necessary things. Exfolation. This can be as simple as applying a Retinol Molecular Serum every night before bed or a prescription of Tretinoin® , or an Acid Serum, Cleanser or Toner. A weekly Mandelic peel would work as well, or a Dermabrasion Scrub a couple of times per week. They all help to achieve the removal of dead tissues and will spark your skin into its regenerating action. This is imperative, so just pick Retinol and one more, or alternate a few and stimulate your skin to work for you. Antioxidants. 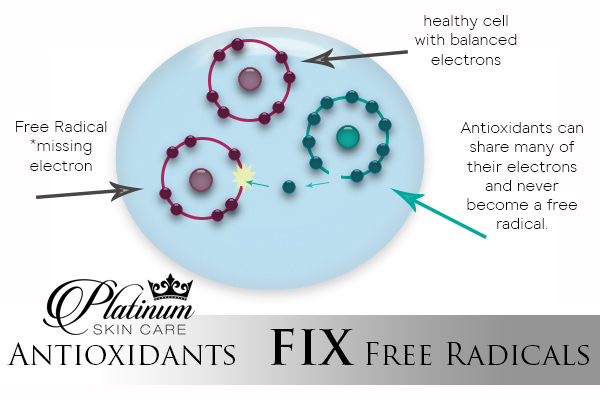 Antioxidants help not only to protect your skin from oxidizing (this happens everyday no matter what just because we are living, breathing beings) but it also helps to fix problems that you already have. Problems like pigmentation and lines are caused by breakdowns and other issues in the skin. The sun causes collagen breakdown as does smoking and many other factors. They KEY to fixing and preventing issues is to apply an antioxidant like High Octane Vitamin C serum every day before heading out. There are many many antioxidants like copper, green tea, pomegranate, vitamin A, resveratrol, vitamin E, coffee berry, grapeseed, vitamin B... just to name a few. Make sure to use at least one every single day to help your skin heal itself and prevent further damages. All of the healthy bright vegetables are full of antioxidants as well, so make sure to incorporate a large variety into your healthy diet. Remember your plate should be at least 1/2 full of vegetables. Sun Protection. The last thing that your dermatologist will recommend is an SPF every single day *even on cloudy days. It isn't just the sun's brightness that causes damages, it is the UV rays. See my video on SPF's, melanoma and even indoor lighting for a more detailed explanation and a recommendation of the very safest bulbs that you can use! Just know it is as important as water is to your body. It is something that you need to make into your next "healthy habit". Even if you remain indoors all day long, if you have lights turned on, you are at risk of UV damages. I hope you have learned from now that beautiful skin starts from the inside and radiates outwards. Everything you put in your mouth will indeed show on your face. You are what you eat has never been more true. It should be your "motto" - it's certainly mine! Now, here are a few last little tidbits for you on skin care products. Always remember to wash your face morning and evening. If you are using one of our acid-based cleansers, you will be exfoliating at the same time as removing your makeup/dirt/debris. Exactly what your friendly dermatologist recommends. *I like to use a little circular sponge when I wash. I wet the sponge, add a pump of my AB Cleanser and then in gentle circles get my entire face clean. Works like a charm and your face is as smooth as silk. Remember that after your basic skin care necessities of exfoliating, antioxidants and SPF there are a plethora of goodies that are specifically geared to tackle your most problematic issues. And everyone has their specific troubles. Peptides and Neuropeptides. Use these every day to stimulate collagen, repair tissues, minimize fine lines and even many deeper wrinkles. Peptides like GABA, Snap 8, Syn-TC, Matrixyl, Matrixyl Synthe'6, SynAke, Argireline, and even stem cells can be used as your first layer of product application. Pigmentation treatments like Fade Bright with alpha arbutin can be applied alongside a Vitamin C Serum to aid in quick treatments. A weekly chemical peel of Mandelic acid or Lactic acid are perfect choices to help regenerate that skin more quickly while fading back pigmentation and gently removing darker skin tissues. Acne treatments like Drying lotion, Benzoyl Peroxide, Vitamin B need to be applied daily to keep blemishes under control. But, if you are dealing with cystic acne (meaning large, hard and un-poppable) then see your dermatologist quickly before they become scarred. Layer your products for maximum benefits. I like to mix everything in my hand for the sake of speed, but to get the most from each product, it should be layered. Begin with your thinnest serums and work your way to the thickest creams. Always end with an SPF as your top layer in the mornings. Don't forget anti aging supplements. No, Dr. Oz doesn't have to mention the vitamin or nutrient for it to be great for your skin. There are many things that we don't naturally get in our diets that we can supplement. I would love to eat algae from across the world every day - maybe - but just can't, so I will get my Fucoidan in a pill form thank you very much. You can get all the biotin, fucoidan, collagen, selenium, hyaluronic, gojiberry ... that you need in our daily 2-pill supplement ReGen. At 120 count that is 60 days before you ever have to think about repurchasing. Plenty of time to see the changes in your skin, hair and body. Please understand that this is the *lifestyle that I follow. Yes, I say "lifestyle" because this isn't a "diet". You avoid what is bad for you only. I have extensively researched the US diet recommendations and have read studies and listened to countless doctors that contradict what we have been told over the past 45 years or so. *Yes, these high starch recommendations have only been around since the 70's and controversially, special interests in the grain, meat, and dairy industries, all of which are heavily subsidized by the USDA were the ones that changed it! When something is changed to suit a market, you know it is not trustworthy, and then have to take matters into your own hands. You can of course choose to follow or not to follow this plan that I have laid out. Take some time and do your own research. Look at the good vs the bad and see where you feel the best place for your health is. *Not everyone has to watch their carb intake, but I keep mine at about 20 per day (net). That works for me and I hope you find what works for you. 4. DietDoctor.com This is an excellent tool to discover doctors, listen to presentations, have studies explained in layman's terms, watch interviews with doctors and patients. Enjoy. *There is a free section and a section that you can pay $9 to see. I feel that is worth every penny and you can cancel anytime you are done reading/listening.